We Offer MANY PROMOTIONS! Check out our store for HUNDREDS of NEW, UNIQUE, HARD TO FIND SMOKE SHOP ITEMS, at UNBELIEVABLY LOW PRICES! This listing is for 1 of. 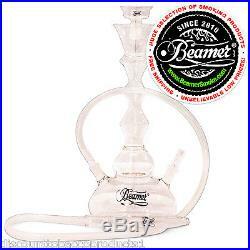 Beamer All Glass Hookah Pipe Set + Limited Edition Beamer Smoke Sticker! For US clients and MILITARY BASES! Beamer Premium All Glass Hookah. High Grade & High-Quality All Glass Hookah Set! Limited Edition Beamer Smoke Sticker. This Listing is for – 1 Hookah Set – 1 All Glass Vase + 1 Glass Funnel Style Bowl + 1 Air Valve Stopper / 2 Hose Converter (w/ Glass Ball) + 1 Silicone hose with 2 glass ended tips (1 Glass Mouth Piece + 1 End Glass Piece). Hookah is 19 Inches Tall by 8.5 Inches Wide. The Hose is 82 Inches Long from end to end. The Glass Handle of the hose is 11 inches long. This hookah is an 1 hose hookah. Can be converted to 2 hose hookah. Comes with Ice Chamber! The Ice Chamber is right below the hookah bowl. This properly holds ice to keep your smoking experience cooler and less harsh! No more freezing your hookah or hose! This Hookah comes with everything in the picture in a plain box. Hookah is stuffed very well with bubble wrap and/or stuffing to protect hookah & avoid breakage/damage! Each and every Beamer Pipe Hookah is meticulously crafted! Our Attention to Fine Detail makes us second to none. Try Beamer Brand Smoking Products Today! Beamer products are backed by a name you can trust in the smoking industry Since 2010! Beamer specializes in hookahs and hookah accessories, hookah flavors, vapor products, candles, smoking products and accessories, and rolling papers and apparel. Beamer Smoke was born in a small basement in Detroit, Michigan U. In 2010 by hookah aficionado siblings. Never knowing where Beamer’s success would lead, Beamer started with one hookah and one case of orange Zig Zags. Now, Beamer is undeniably turning heads worldwide. Beamer Smoke aims to design high-quality products at reasonable prices. Beamer Smoke not only moved out of their basement, but they now have two factories in Detroit, Michigan U. All thanks to customers like you! Every product comes with our 100% satisfaction guarantee. Thank you for your business. We strive for 5-Star Service. We take our job of offering excellent pricing and services VERY SERIOUSLY!! We want to make things right and we will! We CANNOT change your address once the order is placed. If you need us to change an address, you must cancel your order before it ships. EST Monday-Friday (Not including National Holidays). The item “Beamer All Glass Hookah Shisha Nargila Smoking Pipe Set hose Flavors Tobacco USA” is in sale since Monday, March 28, 2016. This item is in the category “Collectibles\Tobacciana\Other Tobacciana”. The seller is “discounttobaccoproducts1″ and is located in Detroit, Michigan. This item can be shipped worldwide. We Offer MANY PROMOTIONS! Check out our store for HUNDREDS of NEW, UNIQUE, HARD TO FIND SMOKE SHOP ITEMS, at UNBELIEVABLY LOW PRICES! This listing is for 1 of. 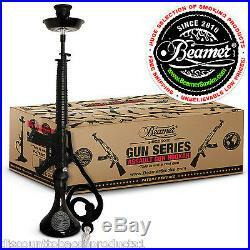 Beamer Gun Series – M 16 Gun Black Hookah Pipe Set + Limited Edition Beamer Smoke Sticker! For US clients and MILITARY BASES! Beamer Premium Gun Series – M 16 Style. High Grade & High-Quality Gun Series Lounge Quality Hookah Set! Professional Lounge Quality Hookah. Limited Edition Beamer Smoke Sticker. This Listing is for – 1 Hookah Set – 1 Glass Vase + 1 Ceramic Egyptian Style Bowl + 1 Air Valve Stopper / 2 Hose Converter + 1 Washable hose + Tongs + Hookah Tray + 1 Gun Stem + 1 Down Stem. Hookah is 37 Inches Tall. Stem of Hookah (Gun) is roughly 25 inches long! The Hose is 72 Inches Long from end to end. The Hand of the hose is 15 inches long. This hookah is an 1 hose hookah. Can be converted to 2 or 3 hose hookah. This Hookah comes with everything in the picture in a beautiful retail box inside a plain discreet box! Hookah is stuffed very well with bubble wrap and/or stuffing to protect hookah & avoid breakage/damage! Each and every Beamer Pipe Hookah is meticulously crafted! Our Attention to Fine Detail makes us second to none. Try Beamer Brand Smoking Products Today! Beamer products are backed by a name you can trust in the smoking industry Since 2010! Beamer specializes in hookahs and hookah accessories, hookah flavors, vapor products, candles, smoking products and accessories, and rolling papers and apparel. Beamer Smoke was born in a small basement in Detroit, Michigan U. In 2010 by hookah aficionado siblings. Never knowing where Beamer’s success would lead, Beamer started with one hookah and one case of orange Zig Zags. Now, Beamer is undeniably turning heads worldwide. Beamer Smoke aims to design high-quality products at reasonable prices. Beamer Smoke not only moved out of their basement, but they now have two factories in Detroit, Michigan U. All thanks to customers like you! Every product comes with our 100% satisfaction guarantee. Thank you for your business. We strive for 5-Star Service. We take our job of offering excellent pricing and services VERY SERIOUSLY!! We want to make things right and we will! We CANNOT change your address once the order is placed. If you need us to change an address, you must cancel your order before it ships. EST Monday-Friday (Not including National Holidays). 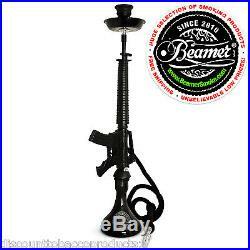 The item “Beamer M16 Gun Hookah Shisha Nargila Smoking Pipe Set Flavors Tobacco Charcoal” is in sale since Monday, March 28, 2016. This item is in the category “Collectibles\Tobacciana\Other Tobacciana”. The seller is “discounttobaccoproducts1″ and is located in Detroit, Michigan. This item can be shipped worldwide. We Offer MANY PROMOTIONS! Check out our store for HUNDREDS of NEW, UNIQUE, HARD TO FIND SMOKE SHOP ITEMS, at UNBELIEVABLY LOW PRICES! This listing is for 1 of. 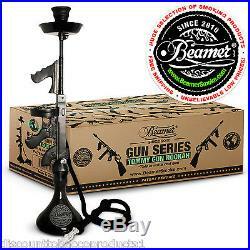 Beamer Gun Series – Tommy Gun Black Hookah Pipe Set + Limited Edition Beamer Smoke Sticker! For US clients and MILITARY BASES! Beamer Premium Gun Series – Tommy Gun Style. High Grade & High-Quality Gun Series Lounge Quality Hookah Set! Professional Lounge Quality Hookah. Limited Edition Beamer Smoke Sticker. This Listing is for – 1 Hookah Set – 1 Glass Vase + 1 Ceramic Egyptian Style Bowl + 1 Air Valve Stopper / 2 Hose Converter + 1 Washable hose + Tongs + Hookah Tray + 1 Gun Stem + 1 Down Stem. Hookah is 34 Inches Tall. Stem of Hookah (Gun) is roughly 21 inches long! The Hose is 72 Inches Long from end to end. The Hand of the hose is 15 inches long. This hookah is an 1 hose hookah. Can be converted to 2 or 3 hose hookah. This Hookah comes with everything in the picture in a beautiful retail box inside a plain discreet box! Hookah is stuffed very well with bubble wrap and/or stuffing to protect hookah & avoid breakage/damage! Each and every Beamer Pipe Hookah is meticulously crafted! Our Attention to Fine Detail makes us second to none. Try Beamer Brand Smoking Products Today! Beamer products are backed by a name you can trust in the smoking industry Since 2010! Beamer specializes in hookahs and hookah accessories, hookah flavors, vapor products, candles, smoking products and accessories, and rolling papers and apparel. Beamer Smoke was born in a small basement in Detroit, Michigan U. In 2010 by hookah aficionado siblings. Never knowing where Beamer’s success would lead, Beamer started with one hookah and one case of orange Zig Zags. Now, Beamer is undeniably turning heads worldwide. Beamer Smoke aims to design high-quality products at reasonable prices. Beamer Smoke not only moved out of their basement, but they now have two factories in Detroit, Michigan U. All thanks to customers like you! Every product comes with our 100% satisfaction guarantee. Thank you for your business. We strive for 5-Star Service. We take our job of offering excellent pricing and services VERY SERIOUSLY!! We want to make things right and we will! We CANNOT change your address once the order is placed. If you need us to change an address, you must cancel your order before it ships. EST Monday-Friday (Not including National Holidays). 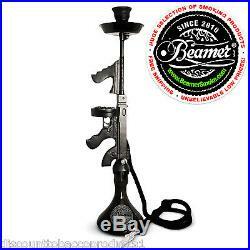 The item “Beamer Tommy Gun Hookah Shisha Nargila Smoking Pipe Set Flavors Tobacco Charcoal” is in sale since Monday, March 28, 2016. This item is in the category “Collectibles\Tobacciana\Other Tobacciana”. The seller is “discounttobaccoproducts1″ and is located in Detroit, Michigan. This item can be shipped worldwide. We Offer MANY PROMOTIONS! Check out our store for HUNDREDS of NEW, UNIQUE, HARD TO FIND SMOKE SHOP ITEMS, at UNBELIEVABLY LOW PRICES! This listing is for 1 of. 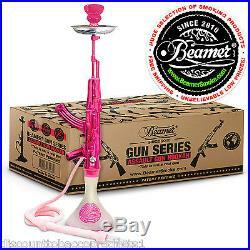 Beamer Gun Series – Assault Gun Pink Hookah Pipe Set + Limited Edition Beamer Smoke Sticker! For US clients and MILITARY BASES! Beamer Premium Gun Series – Assault Gun. High Grade & High-Quality Gun Series Lounge Quality Hookah Set! Professional Lounge Quality Hookah. Limited Edition Beamer Smoke Sticker. This Listing is for – 1 Hookah Set – 1 Glass Vase + 1 Ceramic Egyptian Style Bowl + 1 Air Valve Stopper / 2 Hose Converter + 1 Washable hose + Tongs + Hookah Tray + 1 Gun Stem + 1 Down Stem. Hookah is 33 Inches Tall. Stem of Hookah (Gun) is roughly 21 inches long! The Hose is 72 Inches Long from end to end. The Hand of the hose is 15 inches long. This hookah is an 1 hose hookah. Can be converted to 2 or 3 hose hookah. This Hookah comes with everything in the picture in a beautiful retail box inside a plain discreet box! Hookah is stuffed very well with bubble wrap and/or stuffing to protect hookah & avoid breakage/damage! Each and every Beamer Pipe Hookah is meticulously crafted! Our Attention to Fine Detail makes us second to none. Try Beamer Brand Smoking Products Today! Beamer products are backed by a name you can trust in the smoking industry Since 2010! Beamer specializes in hookahs and hookah accessories, hookah flavors, vapor products, candles, smoking products and accessories, and rolling papers and apparel. Beamer Smoke was born in a small basement in Detroit, Michigan U. In 2010 by hookah aficionado siblings. Never knowing where Beamer’s success would lead, Beamer started with one hookah and one case of orange Zig Zags. Now, Beamer is undeniably turning heads worldwide. Beamer Smoke aims to design high-quality products at reasonable prices. Beamer Smoke not only moved out of their basement, but they now have two factories in Detroit, Michigan U. All thanks to customers like you! Every product comes with our 100% satisfaction guarantee. Thank you for your business. We strive for 5-Star Service. We take our job of offering excellent pricing and services VERY SERIOUSLY!! We want to make things right and we will! We CANNOT change your address once the order is placed. If you need us to change an address, you must cancel your order before it ships. EST Monday-Friday (Not including National Holidays). 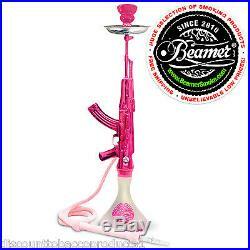 The item “Beamer AK Gun Hookah Shisha Nargila Smoking Pipe Set Flavors Tobacco Charcoal US” is in sale since Monday, March 28, 2016. This item is in the category “Collectibles\Tobacciana\Other Tobacciana”. The seller is “discounttobaccoproducts1″ and is located in Detroit, Michigan. This item can be shipped worldwide.